We are delighted to introduce the USCG Auxiliary Lower Manhattan Flotilla 05-03 Detachment at John Jay. 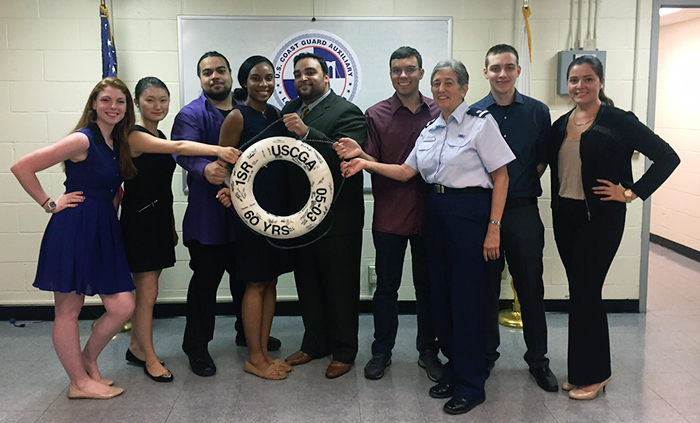 On June 9, 2016, the United States Coast Guard CDR Laura Moose, Director of Auxiliary, First District Southern Region (D1SR) officially approved the establishment of the John Jay College AUP Flotilla Detachment for Flotilla 5-03 effective immediately. The formation of the Flotilla 05-03-001 John Jay College AUP Detachment is a sub-division of the USCG Auxiliary Lower Manhattan Flotilla 014-05-03. The USCG Auxiliary is a non-military program dedicated to support the mission of the U.S. Coast Guard to secure the borders and keep the world safe. The responsibilities of the USCG Auxiliary involve a broad spectrum of on-shore and on-water operations which include waterway patrol, port security, environmental protection, radio communication, and ship and boat compliance. Students who join the detachment have the opportunity to work in various harbor contexts as a volunteer. The Auxiliary University Program (AUP) combines these practical experiences with an academic education to develop students' leadership and technical skills. 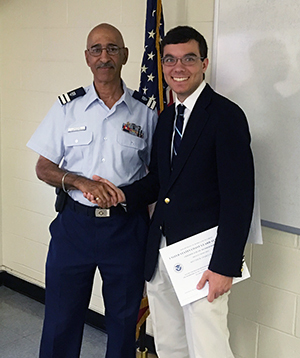 Through academic coursework students are able to obtain a certification and learn about dynamic career paths in the USCG. 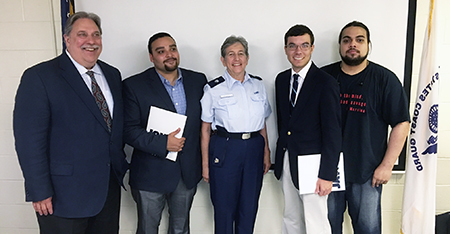 The Student Club JJAUP connects John Jay students and faculty to the USCG AUP by providing guidelines and support. Through JJAUP, students can participate in the USCG AUP community and benefit from the exceptional opportunities the program offers to build their future careers. USCG Auxiliarist and Assistant Professor Susan Pickman, Ph.D., CFE, John Jay College Security, Fire and Emergency Management Dept. was appointed Auxiliary Flotilla Staff Officer/Faculty Advisor for John Jay College AUP Detachment Flotilla 05-03-001. CInauguration of the first JJAUP member Matthew Pascual at the FLotilla 05-03. From left to right: Dr. Charles P Nemeth, Solomon Ditta, Dr. Susan Pickman, Mathhew Pascula, Jayson Cancel. Over The Bow, Volume 76 Issue 1 Winter 2018. A more detailed outline of the academic requirements and course catalogue can be found here. Read more about internship opportunities here. Read more about other AUP Colleges here. 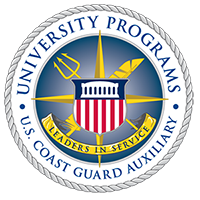 The AUP program provides Coast Guard leadership training and expects college students in the Unit to become future leaders. Read more here. While no AUP member is required to join or enlist the USCG, participation in the AUP opens up opportunities for various career tracks in the USCG. For example, AUP unit attendees have a 70% chance of enrollment in the Officer Candidate School in New London, CT. The Department will be granting some academic credit towards students’ degree studies at John Jay. Presently it is evaluating but we will post announcements in the Fall term. Flotilla/Detachment meetings are scheduled the 3rd Monday of each month (meeting dates are subject to change) at the MIO Building, 1 South Street, NYC at 7 PM (adjacent to the S.I. Ferry Terminal-USCG Recruiting Station). 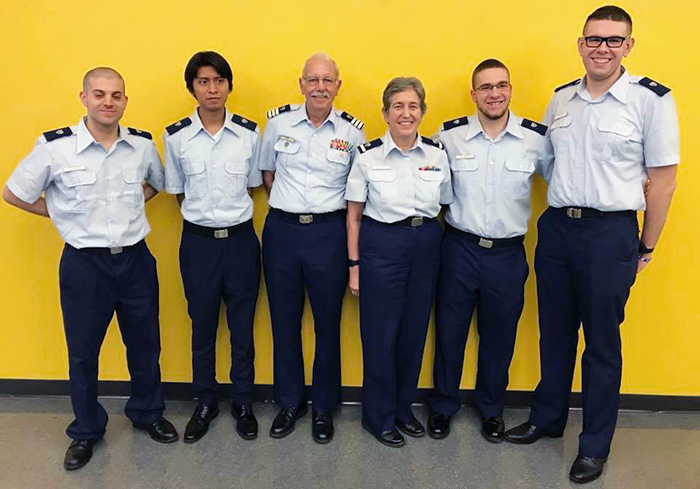 JJAUP welcomes all undergraduate and graduate students at John Jay who are capable and dedicated to contribute to the USCG Auxiliary of the Lower Manhattan Flotilla 05-03. A JJAUP membership is a prerequisite to join the USCG AUP. Step 1: Become a member of the Student Club JJAUP. Fill out this form and send it to Mr. Solomon Ditta at ditta.solomon@gmail.com. Once you receive confirmation of your JJAUP membership you can proceed to step 2. Step 2: Apply to the USCG AUP. Apply online at the USCG AUP. JJAUP will support you through the application process.